In December 2001, new sections of the Commonwealth Government Privacy Act were passed, relating to how organisations handle personal information on private individuals. Council members feel it is important to re-assure members that we do not intend to make your personal information available to anyone outside our organisation. Although the Friends of the Heysen Trail and Other Walking Trails Inc. (FoHT) is not bound by this Act (it only applies to businesses with an annual turnover of more than $3 million and health service providers), we feel that it is desirable to have a Policy Statement, to protect our Member’s rights, and to reassure Members that their personal information will only be used for official purposes. Need for Personal Information: Our Constitution requires the FoHT to maintain a register of personal information relating to all members of the Association, showing their full names and addresses, with telephone numbers where appropriate. Collection of Personal Information: The FoHT collects personal information regarding Members from their paper application and paper renewal forms, or online forms for Membership. From this we record your date of joining, duration of membership, your financial membership status, and your willingness to assist in our various voluntary activities. We hold no information regarding the health of Members. Use and Disclosure of Personal Information: Members Personal Information is used by office bearers and voluntary staff to contact members for the FoHT administrative, operational, maintenance, walking and social purposes but not for personal purposes. It is also used as the contact address for posting the Trailwalker magazine. We may also email you other information you have subscribed to receive. Personal information is not made available over the phone, to any third parties or for any marketing purpose. Accuracy and Security of Personal Information: We depend on the accuracy of the information you provide to us. If there is any change in your address or contact details we ask you to notify the office or update your account online. The register of members is not publicly accessible. Access and Correction of Personal Information: Members are entitled to access their personal information held by the FoHT, and to make corrections. This can be done online (provided you have an email address and have been issued with your account access details), in person, by letter or email. You can amend your subscription notification options at any time by visiting the website, logging in and viewing your account page. The office can also be contacted to change your subscription options. 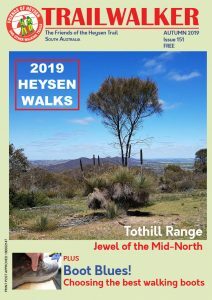 The Friends of the Heysen Trail and Other Walking Trails Inc.